The brand's largest social campaign ever received its highest level of engagement with Facebook Live. As the 2016 Olympic Games draw to a close, so is Coca-Cola’s largest social media campaign ever. To reach teens during the most connected games in history, Coca-Cola launched #ThatsGold, a multiplatform social media effort designed to engage 13- to 19-year-olds with a steady stream of content filled with influencers, musicians, and of course, the athletes. "This is our biggest social campaign yet," said Patricia Pieranti, Coca-Cola’s real-time marketing manager overseeing the brand's Olympics social media activity. "The Olympics are so dynamic that real-time marketing has to happen to make consumers part of the party." Coca-Cola, an Olympic sponsor since 1928, devised a year-long, three-phase campaign to capture teens’ attention before, during and after the games. It's a common strategy for brands looking to capitalize on tentpole events like the Olympics, said Will Platt Higgins, Facebook’s VP of global accounts. "Before the event, the strategy is to build up participation. During, it’s important to engage as much as possible, and afterwards, it's about how to keep that momentum going." Coca-Cola focused most of its social activity on Facebook and Instagram, where the brand regularly sees the most engagement, said Pieranti. It used all of the marketing features available on the platforms, including the recently launched Instagram Stories and Facebook Live. "Coca-Cola always wants to test novelty activations and ways to reach consumers," she said. The beverage brand worked with Facebook, Sao Paulo-based creative agency Mutato, and U.K.-based design lab Kolab to create the content. And it was designed to complement the brand's global #ThatsGold campaign. The advertising, which includes TV, outdoor, and other executions, celebrates "gold moments," everyday happenings that capture the sensation of the win. "Everyone can be gold, like everyone can have a Coke. Coke is a democratic beverage and democratic company," explained Pieranti. "It’s not about performance, but about the gold that happens beyond the podium." The message meant making sure everyone at home wouldn’t get left out — not everyone can get a ticket to the games. Accordingly, from the torch-bearing ceremony to the last swim, dive and, sprint, the brand’s goal was to share select inclusive "gold moments." 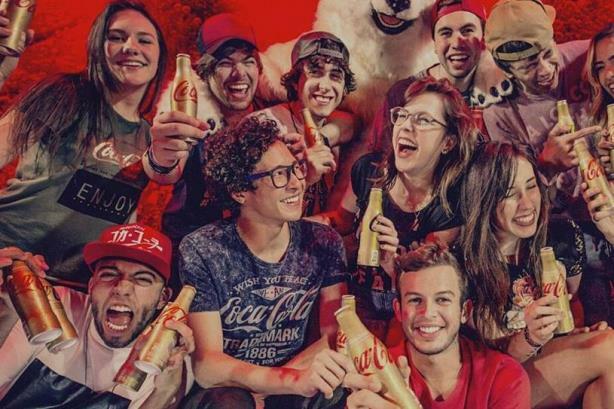 The first phase of the social campaign kicked off a year ago and introduced audiences to #ThatsGold with posts following Coca-Cola’s polar bear mascot as he makes friends with social influencers and athletes on his "road to Rio." A two-minute video featuring the bear talking about the games with YouTube influencer Christian Figueiredo received 1.9 million views, 102,000 impressions, and 1,400 comments. The bear also got its own Brazilian Instagram account @oursooficial. The account, which attracted 144,000 followers, shared photos and videos throughout the games. For example, one post featured influencer Bruna Vieira, who has 1.8 million followers on the platform. Going into the second phase, the brand focused on real-time coverage of the Olympic "Torch Tour Relay," presented by Coca-Cola, Nissan, and Bradesco. Beginning on April 21, torchbearers traveled for 95 days throughout 200 cities in Brazil. Videos and Facebook Canvas ads on Facebook and Instagram told behind-the-scene stories with a host of Brazilian social influencers. This 30-second ad, posted two days before the start of the Olympics, received 4.6 million views, 26,000 impressions, 1,042 shares and 191 comments on Facebook. A top-performing Canvas ad that was created in April got 76,000 impressions, 530 comments, and 421 shares. Overall, the brand saw an 88% accuracy rate for targeting the teenage audience during the second phase of the campaign, said Pieranti. When the torch reached Rio and the opening ceremonies began on August 5, the third and most significant stage of the campaign began. This phase was all about capturing and sharing the events that took place at the brand’s Olympics station in Rio, called "Parada Coca-Cola," where a team of 105 people worked to keep guests engaged. The space served as a hang out for fans and a venue to host a variety of events that featured entertainers, influencers, and athletes. "It’s not only a concert. In the middle of the show, we have an athlete interacting with an artist," said Pieranti. "This entertainment part is relevant to teenagers because they like to follow these artists." Every performance was shared with Facebook Live, and this content ended up generating the most engagement for the brand, said Pieranti. Facebook’s Higgins said the live-video content was well-received because it made viewers feel like they were part of the moment. "There’s an authenticity and lack of scriptedness that audiences find really compelling," he said. And fans that didn't get to see the live-streamed performances could see what they missed on the brand's Facebook page. The social team condensed the hour-long Facebook Live videos into one-minute clips, "snackable gold moments," said Pieranti. The video of popular Brazilian musician Luan Santana’s performance received 1.4 million views, 60,000 impressions, 1,607 shares, and 879 comments. Throughout the games, Coca-Cola also took advantage of the 360-degree capabilities of Facebook Messenger and the new Instagram Stories feature. At the Coca-Cola station in Rio, the brand created the "Gold Room" where visitors could create 360-degree images and share them through Facebook Messenger. And with Instagram Stories, Coca-Cola rallied social influencers to share content only made available for 24 hours. Coca-Cola has already started planning for the 2020 Summer Olympics in Japan. The brand’s Japanese team already met with Pieranti to discuss real-time possibilities. There’s no sneak peeks so far, but expect to see a return of the polar bear.